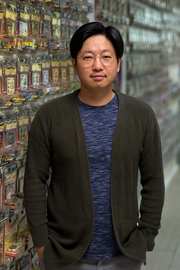 Sei Cho started as designer at Jada Toys in 2003, then worked for Hot Wheels, then moved on to a different design industry and came back to die-cast industry as a manager at Jada Toys since May 2016. Early Jadatoys he worked on casting and graphic design for Import Racers, Dub City and Initial D.
At Hot Wheels he worked in the trend group. There he worked on casting design and a little bit of graphics for the essential line products, Dropstars, Dropstars UAV, Custom Classics. Then there was a freelance phase where he worked on casting designs for the DUB Garage X Toystate. He is currently at Jadatoys where he worked on casting and graphic design for Big Time Muscle, Just Trucks, JDM Tuners and entertainment vehicles such as the Fast and Furious and Transformers models.